A Welsh theatre company has produced a play based on the experiences of cancer nurses in Wales. Theatr Genedlaethol Cymru will be touring Wales in November and December with its production of Nyrsys, which is set in a hospital cancer ward. The play depicts the day-to-day lives of cancer nurses working in the NHS. It is performed in Welsh but an English translation is available via a downloadable mobile phone app. 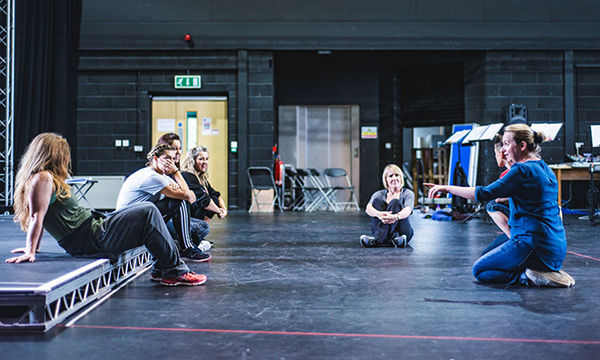 The script, written by Bethan Marlow, is based on interviews with cancer nurses, and the play also features songs written by Ms Marlow and Rhys Taylor. Ms Marlow said: ‘I’ve been interviewing cancer nurses for more than three years now, and it’s been interesting, difficult and fun. 'I began with a completely deluded idea of what it was to be a nurse and what a day at their work looked like. ‘I imagined that I would be interviewing them on the ward during their shift, walking up and down their corridor as they popped in and out to see different patients. ‘The pace that they have to work at is unbelievable,’ she added. ‘The amount of tasks and work that they have to do, constantly prioritising in their heads, is incredible. ‘However, there was one thing I was absolutely right about: when I managed to get a group of nurses together outside of work for a cuppa and a chat, I definitely did laugh. The black humour, the mischievous pranks they played on each other, and talks of previous nights out, had me in absolute stitches. A special offer is available for all NHS staff to buy tickets at 10% off the normal price; they can quote ‘NyrsysGIG’ when buying tickets and show their ID card when they arrive for the performance.